As I mentioned a couple of weeks ago, we have a session coming up at the Minnesota Library Association Annual Conference this fall in St. Cloud. 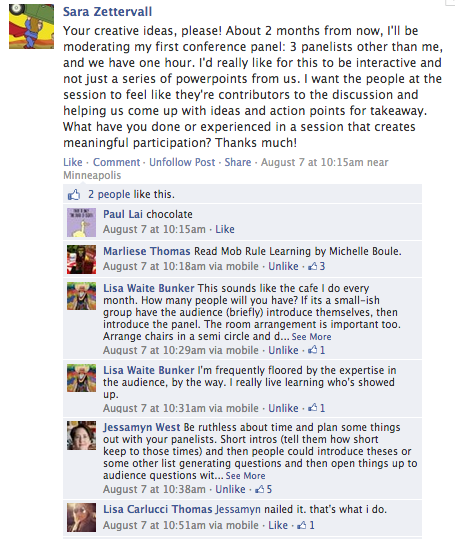 …And Social Justice for All: How Can Librarians and Social Workers Collaborate? will take place on Thursday morning, October 10, 2013, from 10-11am. Here are the details. But more than that, I’m looking for thoughts on what we should discuss and how we should discuss it. 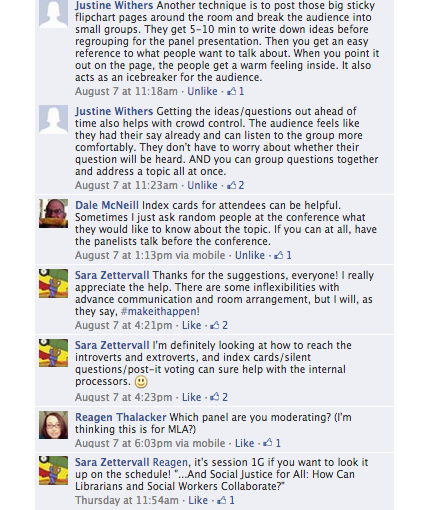 Below the session description and the bios of our panelists – who I’m sure will be amazing contributors – are screen shots of my reaching out to ALA Think Tank about this on Facebook. I’m hoping to continue to build on those ideas after this post. What do librarians and social workers offer each other in their educational paths and on the job? Where has there been successful interaction between librarians and social workers on the job? What are some shared social justice issues that both librarians and social workers address in their working lives? Where do panelists see potential for growth in our overlapping fields? A panel of librarians and social workers will address these questions and their own collaborative experiences. Audience members are encouraged to ask questions and offer their own suggestions. If you’re not familiar with current work in this area, never fear—we will start with a brief introduction before diving into discussion. Ultimately, this session aims to offer action points as a takeaway, so that participants can follow up on connections and ideas generated by the session. Sara Zettervall (moderator) is the Associate to the University Librarian at the University of Minnesota. Previously, she was a Substitute Librarian for Dakota County Library (MN) and Project Manager at the University of Minnesota Performing Arts Archives. Her past work includes creating a pleasure reading collection for a Minneapolis charter high school and leading an after school book club for teen Somali girls, co-led with co-panelist Mary Nienow. She is passionate about and published in issues of social justice in librarianship. She holds an MLIS from St. Catherine University and an MFA in Creative Writing from the University of Michigan. Amy Mars is a Substitute Librarian in Hennepin County & Dakota County Libraries and teaches information literacy at Minneapolis Community and Technical College. She is passionate about library outreach and her past work includes initiating library collections in local homeless shelters Hennepin County and publishing a feature article in the March/April 2012 issue of Public Libraries,entitled “Library Services to the Homeless.” She is currently implementing a grant to extend library programming to senior residences in Hennepin County. Mary C. Nienow, MSW, is the Director of Internships and Clinical Instructor in the University of Wisconsin-Eau Claire’s Department of Social Work, as well as a PhD Candidate in the University of Minnesota’s School of Social Work, focusing on macro practice. She most recently served as the Executive Director of Child Care WORKS, a statewide child care advocacy non profit in Minnesota. Before joining Child Care WORKS, Mary was the lead researcher on Health and Human Services budgets and policy for the Minnesota Senate DFL Caucus. Jeanne Stevens has more than 25 years of experience working in college, university and public libraries. In 2012, she joined the Hennepin County library’s Outreach Services department as coordinator of the At Home by Volunteer program, which provides library service for homebound individuals. Additionally, she manages the Deposit Collection program, which places mini library collections (books, audiobooks on CD, and more) in 70 senior residences in Hennepin County. Her newest project is to arrange for volunteers to visit small living facilities, such residential care homes and smaller nursing homes. She also has an MSW from St. Thomas/St. Catherine’s Universities and worked as a social worker at Lutheran Social Services and St. Paul Public Schools.